PC / Hardware / Hard Disk Drives / SATA / 2.5"
This aluminium-enclosure enables you to install a 2.5" SATA HDD or SSD and provides up to 4 different connection options due to its special Multiport USB 3.0 + eSATAp interface. 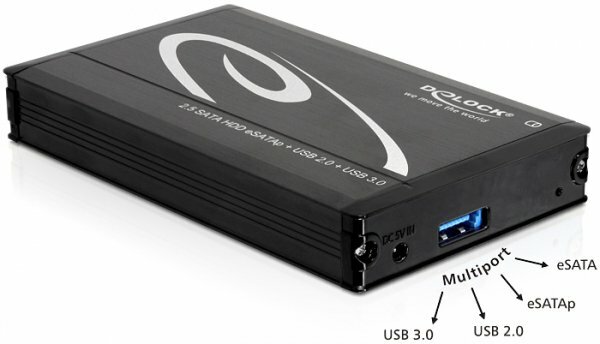 The Multiport is a combination of eSATA and USB 3.0 interface, which supports fast data transfer rates and a voltage supply of up to 5 V. For extra voltage supply when connecting via eSATA, you will find an additional power cable included with the delivery. The enclosure is suitable for 2.5" hard disks with a height up to 14.5 mm.